What does the Virginian, Old Woody, Sunflower, Staghorn, Crusader, Bellflower and Master Cross have in common? These are some of highest quality banjos made by Geoff Stelling at Stelling Banjo Works, located in Afton Virgnia. I like to think of them as the Rolls Royce of banjos. In the early 1970s, I first heard of the Stelling banjo after listening and studying the banjo technique of Alan Munde, one of my favorite banjo players. I read an article that claimed that Alan Munde was playing a banjo called a Stelling Staghorn. It was still hard for me to imagine that the Gibson banjo could be beat. I was playing a Gibson RB 250 at the time. At age 12, I saved my hard earned allowance money for that Gibson and I was proud to own it. I still have it today. 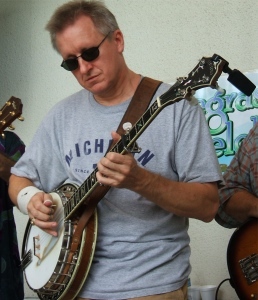 Yet, I was curious about what attracted Alan Munde to the Stelling banjo. In 1974, Stelling Banjo Works was founded by Geoff Stelling. In the mid-1960s, while in College and later stationed in the Navy, Geoff played a bass and banjo in various semi-professional bands. In a November 1977 BNL inteview, Geoff explained that he tinkered around with his early inexpensive banjos (Kay, Vega, Sears) that had obvious sound limitations. Of course, those banjos were beginner models. It’s true that you get what you pay for. Today, Mr. Stelling’s business keeps going strong. The Stelling banjos are made of the highest quality walnut and maple woods, utilize the Tony Pass old wood rims, and have well designed tail pieces. 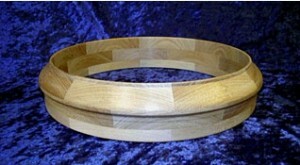 The Stelling patented wedge-fitted pot assembly allows for the best tone ring and flange to wood fit possible. 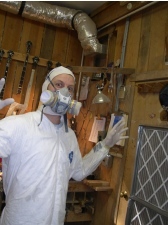 For more information on Mr. Stelling’s company and his instruments, see www.stellingbanjo.com. It took awhile but thirty years later, I was in the financial position to buy a Stelling Staghorn. Whether performing on stage or playing for others in a more intimate setting, people constantly ask me about the banjo. They are impressed with the sound of the instrument. Who knows, maybe thirty years from now, if I am still alive, I’ll buy another Stelling banjo. For now, I’ll keep picking away on my own Staghorn that I first read about in the early 1970s. Author’s Note: Feel free to share your own Stelling banjo experiences by posting to this article. This entry was posted in Banjo and tagged banjos, stelling banjos, tony pass rim. Bookmark the permalink. What do you mean “if you are still around”? We already have decided that I have to live to be 140 if I’m going to master both the guitar and the mandolin….and you promised to be there, teaching me!!!!! I agree with all you say about Stelling banjos, but their service is incredible. I just had a bunch of work on my 1979 Gloden Cross and Geoff Stelling was terrific. If you can get your hands on one, you should. While I don’t have a Staghorn, I do have a Sunflower which I bought new in 1983. Whenever I travel I like to go to shops that sell lots of banjos and try them out, just for fun. Stellings are so solid and well made that I really believe there is none better. There are others that are different and quite nice also but I Stelling’s are second to none. The neck shape is slender and great and it really sounds like a canon if you want to punch it up. While mine does not have a pass rim, the 26 year old original rim sounds so good I see no reason to retire it. Just for reference, in 1983 I paid $1000 for the Sunflower and $300 for hand engraving. In overall weight was a lilttle bit more in those days also compared with the new Sellings. In those days, Geoff was in California and the engraver in Colorado. The engraving is really great and I think that hand engraving is not the norm these days. If I remember correctly, the Staghorn was about $1800 in those days. I could never part with my Stelling. 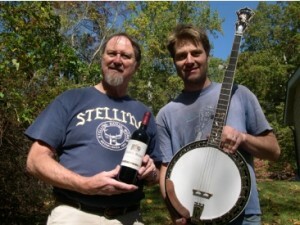 The photo shown above is just before FedEx picked up the banjo (not the wine) to go to France. If I had had to deliver the banjo personally, I don’t think I’d look quite so good. Thanks to all who had nice things to say. I don’t really plan on being here in 30 years, but I may get lucky. Good picking to all. I would just like to say that I think we are all truely blessed to have someone like Geoff in our lives. He has created a legacy in a supurb banjo that will carry on for many years to come. Thank you so much Geoff for your creation to all musicians. We will cherish your instrument for years! By the way, I love my Master’s Cross. Definitely a God send. I have a Stelling “Moonshadow” , i love the way it plays and the beautiful workmanship. I plan to upgrade the rim with a Tony Pass. I’ll have to give a update after the retro fit. 1. Forgetting for a moment about the expense, would anybody re-install the 3-ply rim for any reason? 2. Does anybody still play the 3-ply maple rim and prefer it for any reason (other than the expense of converting)?